When I purchased the Nikon 200-500mm lens it never occurred to me that I would be using it for much of the time in our backyard. We have a very nice garden with native plants to attract the birds from our location. All of the images below are from the 200-500mm f/5.6E zoom lens. The image below is of a Little Friarbird on a bottle brush tree, the birds love trees and bushes such as this and it is a great attraction to your garden. When using the lens in the backyard it makes it far more comfortable if I use a tripod or monopod. The lens itself does not need the support as it has excellent VR to stabilise for any camera movement, but this lens is quite heavy if you are using it for any length of time. 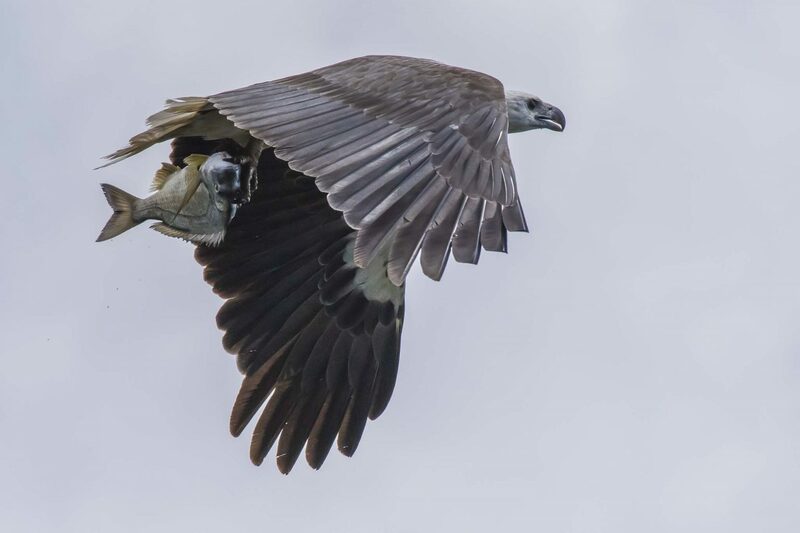 The next image below is of a White Bellied Sea Eagle flying overhead. I managed to catch this image as I was photographing honey Eaters in the yard when this eagle flew overhead with the bream in its talons. With images such as this there is some luck but you do need to be prepared with your camera if you do encounter such a nice photographic opportunity. The next image below is a Blue Faced Honey Eater feeding on the bottle brush bush, the birds really love this type of flowering plant and sometime go into a feeding frenzy. One thing I should mention is that sometimes I use my camera in crop mode if the 200-500mm lens is not long enough. The D810 camera has a x1.2 and x1.5 crop mode and this can be very useful if not quite close enough to the birds. We are also fortunate to have some lake frontage to our back yard and this enables us to capture water birds also. The image below is of two Pacific Black Ducks. In addition to birds we also get occasionally some other interesting creatures in our yard to photograph. 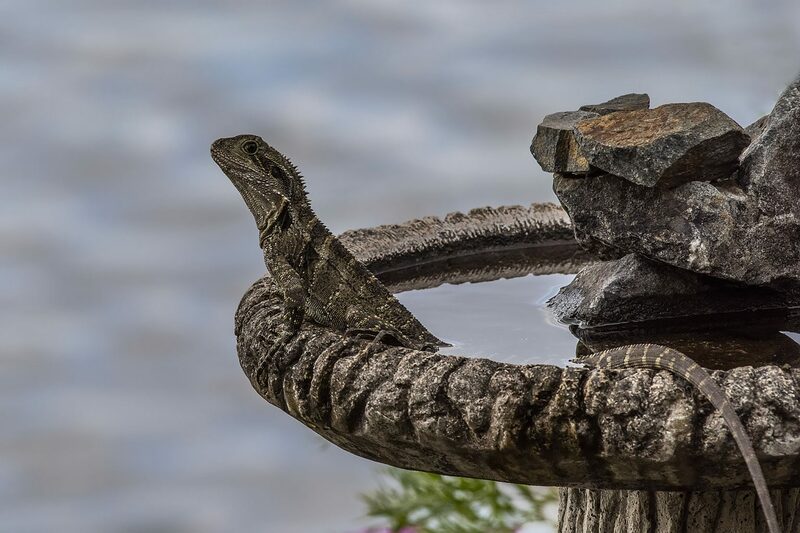 In the image below we have an Eastern Water Dragon taking a visit to the bird bath. Any visitors are quite welcome to visit us.